Reason for posting: A variety of stimulant and nonstimulant medications are used to treat attention deficit hyperactivity disorder (ADHD) in adults and children. However, very rare but serious cardiovascular adverse events, including death, have occurred in some users of these drugs. As such, Health Canada recently advised1 that nearly all of the drugs used to treat ADHD in Canada will now carry cautionary warnings of these rare but serious adverse events. The drugs: The drugs in question (Box 1) all confer mild or moderate stimulatory effects on the sympathetic nervous system and are known to increase blood pressure and heart rate. These sympathomimetic properties, at least theoretically, increase the risk of sudden cardiac death. Other nonfatal cardiovascular events reported in users include syncope, chest pain, myocardial infarction, stroke and arrhythmias. The risk of cardiovascular adverse events may be greater among patients already experiencing cardiovascular compromise or cardiac abnormalities, or those using other sympathomimetic drugs. Although the Health Canada advisory cites no data, a recent FDA safety review2 summarizes some details of cases of sudden death associated with these drugs. The background population rates of sudden death appear to be as high as 4.6 per 100 000 person-years among children and adolescents and about 100 per 100 000 person-years among adults. Patients taking the ADHD drugs do not seem to have higher rates of sudden death than these, and no one agent appears to have a markedly worse risk profile than any other. However, conclusions that can be drawn from studies of postmarketing adverse events are limited: such adverse events are known to be underreported, reports often contain insufficient clinical details (e.g., doses taken, patient comorbidities and other drugs used), and denominators are uncertain (the real degree of drug exposure is unknown — estimates are usually based on the number of prescriptions dispensed). Properly designed case– control studies are being considered but are difficult to perform given the rarity of these adverse events. Few clinical trials involving children and adults have been carried out lasting more than a year, and deaths are rare enough that clinical trials are usually underpowered to detect differences between study groups. What to do: Individual responses to drugs vary greatly: most users do not experience serious adverse events, and among those who do, in many cases it is unclear why. Of the patients who experienced sudden death, some had underlying cardiovascular abnormalities or other risk factors for sudden death. Some died after just a few doses, whereas others died after months of drug therapy. Causality can often be implied but not proven. The general precautions recommended by Health Canada (Box 2) appear reasonable. In addition, patients should be prescribed the lowest effective dose of the drugs for the least amount of time, and their vital signs should be monitored. There is currently no evidence of the effectiveness and cost efficacy of performing baseline or subsequent cardiac investigations (e.g., electrocardiography, echocardiography), particularly in asymptomatic, healthy patients with a normal baseline screening history and normal findings on physical examination. 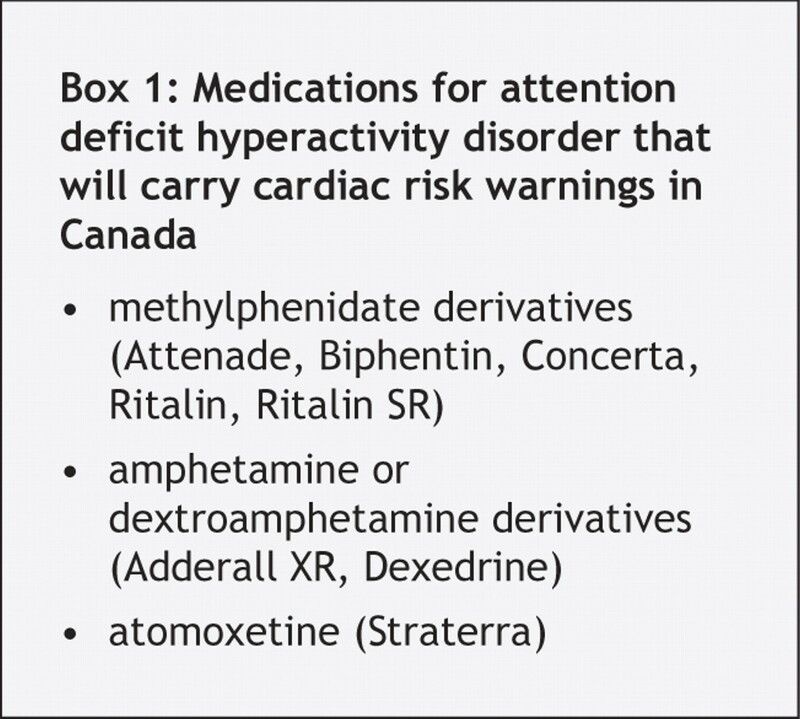 Attention deficit hyperactivity disorder (ADHD) drugs: updated and standardized labelling regarding very rare cardiac-related adverse events [dear healthcare professional letter]. Ottawa: Health Canada; 2006. Available: www.hc-sc.gc.ca/dhp-mp/medeff/advisories-avis/prof/2006/adhd-tdah_medic_hpc-cps_e.html (accessed 2006 Jun 8). Office of Drug Safety. Follow up review of AERS search identifying cases of sudden death occurring with drugs used for the treatment of attention deficit hyperactivity disorder (ADHD). Rockville (MD): US Food and Drug Administration; 2006. Available: www.fda.gov/ohrms/dockets/ac/06/briefing/2006-4210b_07_01_safetyreview.pdf (accessed 2006 Jun 8).